So for clarification GedView can use GPS to add the current location to an event but if the latitude and longitude are not already entered, they won’t automatically be filled in when a location is searched for or entered into the place field. Today I’ll be reviewing an app called Heredis. Heredis is a free app in the Apple App Store. The current version is 1.2.0 and the reviews in the App Store vary from poor to good. You can add a “Personal Link” to a record. This can link family members and provide a label for those linked family members. This is a unique functionality I haven’t seen before and I liked it. You can add a person from the search screen. This functionality gets an A+ in my humble opinion! You can mark a child as being part of a union from the search screen…another A+ for functionality here! An interesting addition to this app is the “Indexes” tab where you can see all the places that have been entered into your family tree. Under each place are items that have been assigned to the place and you can tap on one of those assignments to be taken to that individual/event. It has a field for child status but it needs some updating. It lists options like foundling but doesn’t list step-child as an option. In today’s society, either the ability to add custom labels or having every label conceivable is a MUST. There is a field for prefix (good for doctors, etc.) and suffix (not all apps have that option), there is not a field for middle names and if you add suffixes they aren’t shown in the immediate family view. You can’t add a child from an individual’s record. For example, if you’re in the father’s record and discover that father has a child not listed, you can’t add the child from the father’s record. However, being able to add from the search screen keeps that from being too much of a hassle. From the look of this app, I anticipated this had been the app to use Apple’s swipe to delete functionality. It does not, which is a shame because that’s a great functionality to utilize for any app. It would be nice to see more charts added. At this time the only chart I can create is a pedigree chart. 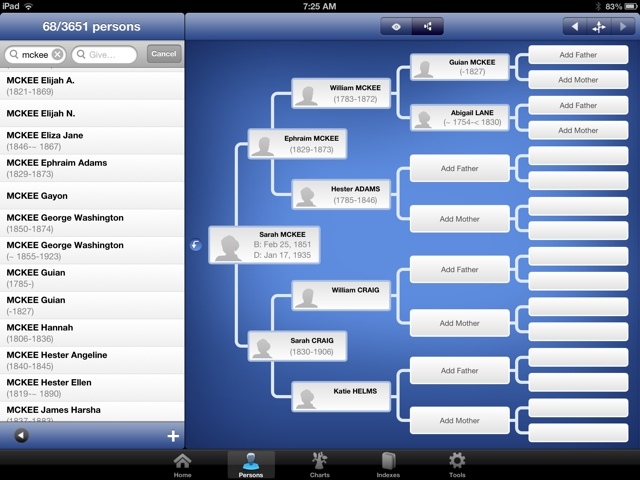 Granted, it can be a very pretty pedigree chart or it can be a very simple pedigree chart but it would be nice to be able to at least get a family group record out of the app in addition to the pedigree chart. There is a basic help menu but it doesn’t go in depth into each field or screen. The website has guides for the Mac and PC version but there’s no guide available for the iOS version. There is a forum but when I tried to locate any kind of FAQ section, there was none to be found. I’m still wondering what the “Signature” field is for. The “Nickname” field is not a searchable field. This isn’t good in my opinion as there are some people in my family tree that I used to only know by their nicknames. There aren’t many bells and whistles with this app. It has a nice interface and I would recommend it for either a new or mid-level iGadget user. It’s prettier than GedView but I think GedView is a far better choice simply because it comes with a much better help document, has more options and is more of a workhorse app. I feel just the help document alone is far more important than how pretty the interface is. Heredis is currently free, which is a nod in its direction. Overall this is an slightly above average app. It performs well and really comes down to how pretty you want your app to be and how many bells and whistles you want to play with.